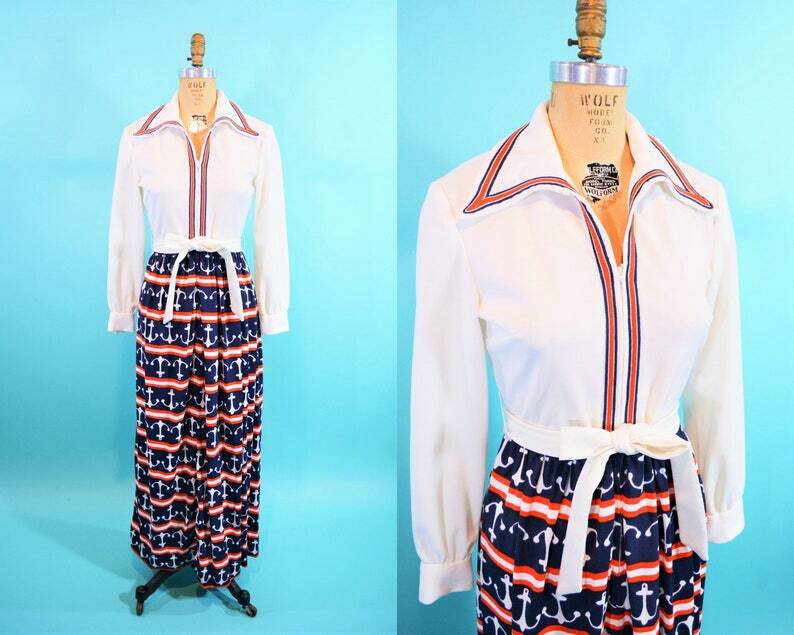 1970s anchor dress | novelty print zip up vintage maxi dress | W 28"
A 1970s anchor dress with a fun novelty anchor print in white, blue and red on the skirt and a solid white collared long sleeve top with red and blue trim detail that zips up the front. 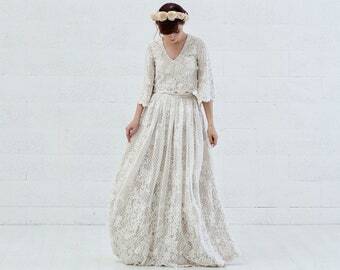 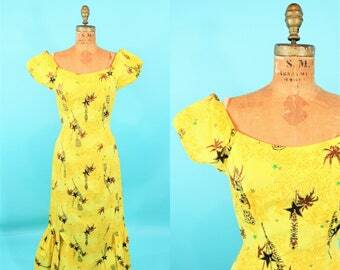 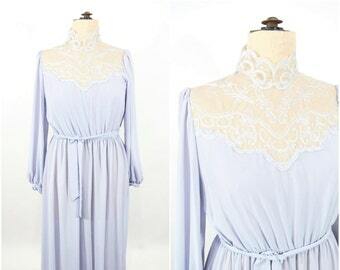 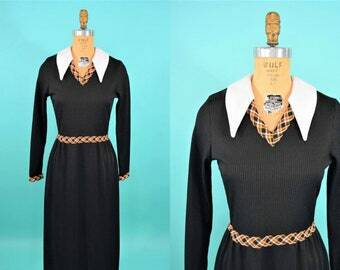 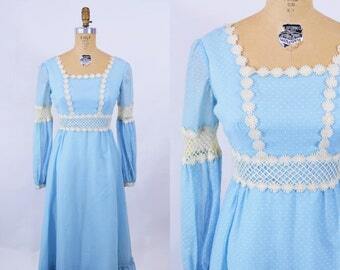 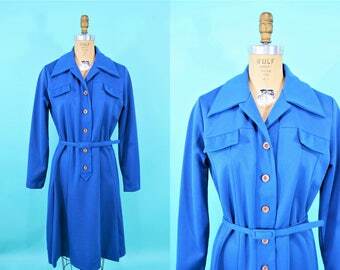 This vintage dress is so sweet it even has little anchors on the gold buttons! 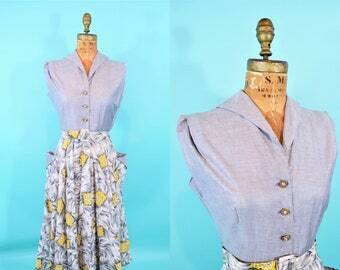 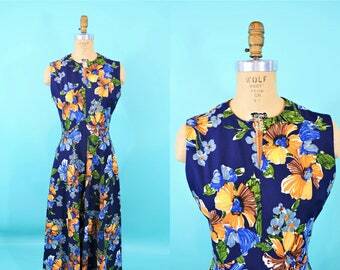 Follow Storyland Vintage for sneaky peeks at vintage before it hits the shop! 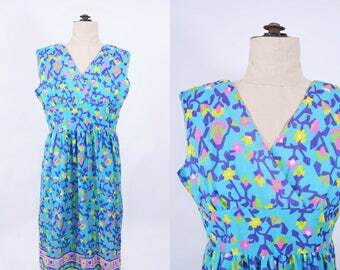 1970s maxi dress | red keyhole polyester vintage evening dress | W 30"
1970s boho dress | yellow floral flutter sleeve vintage maxi dress | W 29"
1970s maxi dress | navy blue floral print empire dress | vintage 70s maxi | B 37"
1970s black maxi | white pointed collar plaid detail dress | W 28"
1940s silk dress | novelty print blue pink vintage dress | W 22"
1970s maxi dress | bohemian dotted swiss vintage maxi | W 26"
1960s tiki dress | Hawaiian yellow Island Casuals novelty print vintage maxi | W 26"
1970s Hawaiian dress | barkcloth tropical hibiscus print vintage maxi dress | W 28"
1970s maxi dress | blue floral border print vintage dress | W 35"
1970s folk dress | brown fringe winter DEADSTOCK vintage dress | W 33"
1970s maxi dress | calico bohemian pink lace up maxi dress | vintage 70s dress | W 27"
1940s shirtdress | gray yellow novelty print pockets vintage dress | W 25"
1970s shirt dress | cobalt blue vintage day dress | W 38"